TED Talks are fantastic for listening practice, for advanced level learners especially. There are several reasons for this. TED Talks are usually quite short, and so the learners don’t get bored or tired. They are always on really interesting topics, offering the possibility for class discussions and debates on the opinions expressed. You can make fun and interactive activities with them! For this last one I have made 3 examples below. They are simple gap fill exercises, not anything new. But they elicit good vocabulary practice and audio comprehension. Also, it’s very similar to part 2 of the Cambridge Advanced listening paper. So it’s even better practice! Either give these for homework or find the video on Youtube to do the activity in class. 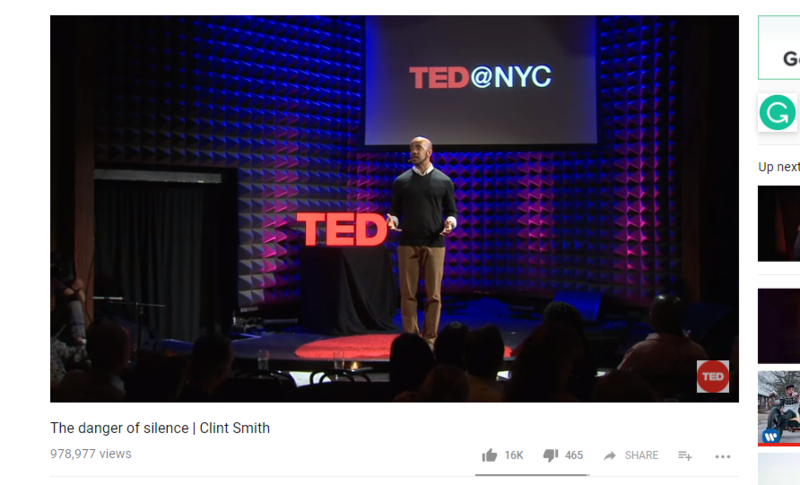 You will hear a man named Clint Smith, talking about the dangers of not expressing your opinion. For each gap, write the words that you hear. 1. Clint says that Martin Luther King gave a speech in ___________ on the civil rights. 2. Clint says that he encourages his pupils to express the silence they experience through _________. 3. He says that he wants his students to recognise that these silences are not _________________. 4. Clint tells us that he was raised by a _________ family. 5. He says that he once believed that giving up his ___________________ was the most powerful sacrifice. 8. He says that silence is the consequence of ________. You will hear a man called Derek Sivers, talking about personal objectives. For each space, write the words that you hear. 1. Derek says that speaking about your personal objectives makes you __________ to achieve them. 2. Derek says that usually, people are not _________ until they have done the work. 3. He theorises that telling our friends about our goals goes against _______________. 4. A man called Kurt Lewin called the same theory ___________ in 1926. 5. Derek says that the second group of people in the test thought they were _______________ to achieving their goal. 6. Derek tells the audience that the brain confuses ______________ for the doing. You will hear a woman called Arianna Huffington, talking about the benefits of sleep. For each space, write the words that your hear. 1. Arianna says that the people in the audience are ‘Type A’ and _______________. 2. She tells the audience that she had an accident where she broke her _____________. 3. During her research, she consulted scientists and __________________. 4. She says that leaders in business and politics at the moment make ________________. 5. Arianna says that ______________ is being able to see disasters before they happen. 6. Arianna comments that women who have slept for 7 or 8 hours are able to see ___________________. Previous The Importance of Homework in the Adult Classroom, and How to Get Them to Do It. Next Young Learners (YLE) A Useful Process Or An Unnecessary Qualification?